Viterbo is the perfect starting point for a fishing trip to one of the best rivers (one among the many central Italy offers to the flyfishing addict) you can take advantage of. It is not near our medieval town but the environment is really worth the three hours’ drive. I first fished river Volturno some 35 years ago and I must confess that the environment has not changed much since those green years. The stretch has a very long no-kill stretch, divided into different fishing sectors each of them with their own special rules (fly only, flyfishing and spinning…) . 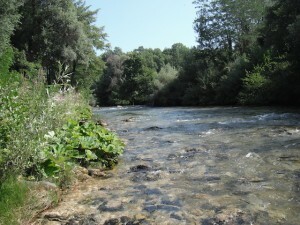 The rest of this part of the river can be fished using also other techniques while with the fly you are obliged to stick to no-kill regulations. When I decide for this wonderful river, I normally stay at the hotel situated only 20 meters from the water. Before breakfast I usually have a look from the bridge to check if fish are active before choosing the stretch to start with. The upper stretch (near the hotel) contains trout: brown, rainbow and char. There are also very rare – but huge – chub. 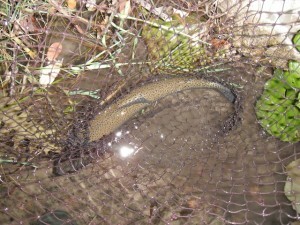 Average size of trout is around 35-45 cm with some specimen reaching 70+ cm. They are extremely shy and difficult to catch in spite of the relatively easy casting conditions. The lower part is more “savage”, with a strong and much colder – and deeper – water. Fish are a little smaller: mostly browns and (a rarety for central Italy) grayling. Casting is very difficult because of the many overhanging trees and the speed and depth of water. Therefore, rods longer than 9,5″ are of little or no use: best are 7.5-8″, line 2-4. Giving suggestions as for flies is very hard: you may need the full selection of patterns, from the huge terrestrial or sedge to the very very tiny midge (#28). I recently went fishing this stream with friends, spending 3 full days on the water after a terrific dry season. Water level was to the lowest minimum, fish where apathetic and resting on the river bed most of the day and fishing was extremely hard. Nevertheless, we succeeded in rising some nice fish thanks also to the experience and the knowledge of the water, granted by the many visits we paid to this top-of-the-top river.